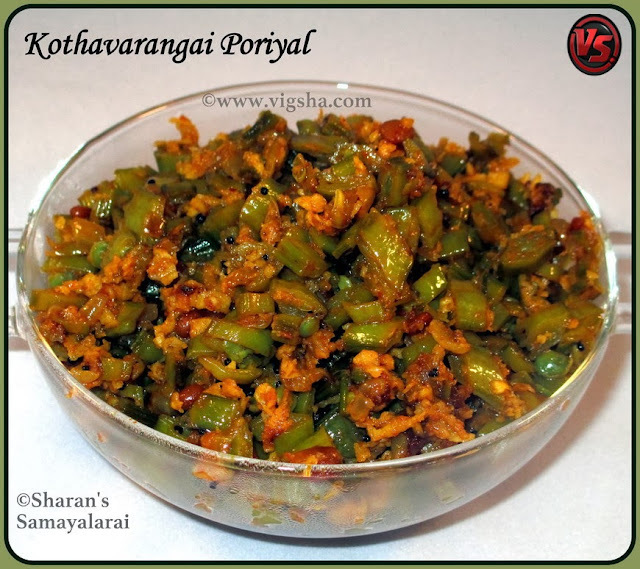 Kothavarangai Poriyal is a popular South-Indian poriyal. Kothavarangai is from beans family with a tint of bitterness. They are very rich in fiber and protein, and helps to reduce the cholesterol level. 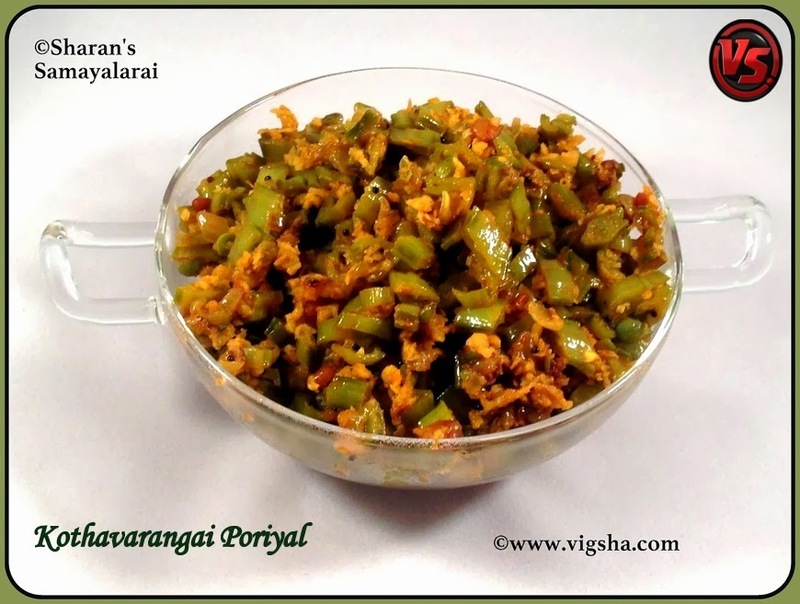 This poriyal is a great accompaniment with sambar rice and curd rice. 1). Wash Kothavarangai, discard the head and tail, then peel the veins. Pile a few together and chop it finely. 3). Then add the chopped kothavarangai, along with turmeric powder, chilli powder, salt and mix well. Add a cup of water and cook for 10-12 minutes in low flame, stirring often to avoid burning. Cook covered till it becomes soft. 4). Once it becomes soft and tender, add grated coconut, give a quick stir and switch off. Serve hot ! It goes well with any Kuzhambu or Rasam varieties. # You can also cook the veggies in microwave and do the sauteing later. # Adjust water accordingly, it might require more/less depending on the variety of the Kothavarangai. Cook till it becomes tender but firm. Make sure not to overcook it. # I prefer to chop it finely, you can also cut it long 1" inch pieces. # Tip update from my friend Sudha :- Add coarsely powdered peanuts instead of grated coconut for a crunchy flavor.